Happy Thanksgiving everyone! It is brilliant to have readers all around the world and really nice to discover whenever any of you have special days that you like to celebrate, to those of you Stateside I hope that you have a wonderful day. I promised you pictures of the completed work from last Saturday’s workshop at Clasheen as soon as I recieved them by email so here are Ann’s and Alisons, I think that Lindsay is still embellishing hers so you will just have to wait another while! If you look closely at Ann’s work some of the smaller leaves are actually three dimensional and stitched in place after the rest was felted. This picture probably dosen’t do the colours full justice, the leaves really have loads of silk fibres and silk chiffon as surface decoration which gives a beautiful depth to the felt and the background is a warm creamy white. Alison’s landscape really came together as the day progressed. There is a palpable feeling of motion about the wall hanging, I can just imagine the tree swaying in our local mountain breeze! The colours really remind me of the Blackstairs mountains which surround my house, at the moment they are a beautiful heathery purple (from the heather!) and a rich golden brown from the dying heather. In response to some queries about the size of my hearth rug, it measures just over 1m by just under 1m. This probably translates to about 4′ X 3′ but I don’t have an imperial tape measure that I can lay my hand on at the moment! 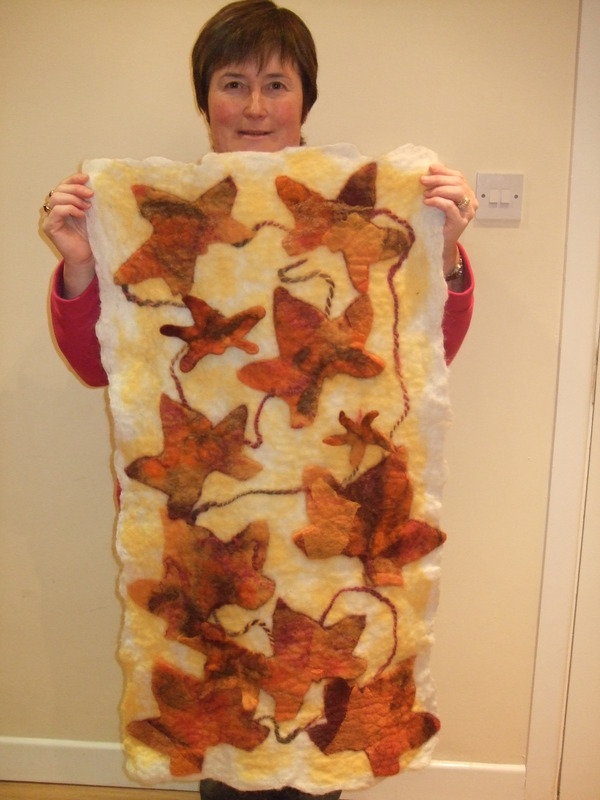 This entry was posted in Felt, workshops and tagged chiffon, Clasheen, Felt, felt hearth rug, felt rug, felt wall hanging, felt workshop, felt workshops, Felting, hearth rug, silk, silk chiffon, Thanksgiving, wall hanging, wet felt, wet felting, workshop by Nicola. Bookmark the permalink. The wall hangings turned out wonderful. Loved both of them. Yes, we did have a great Thanksgiving, now need to think about all the calories we consumed. 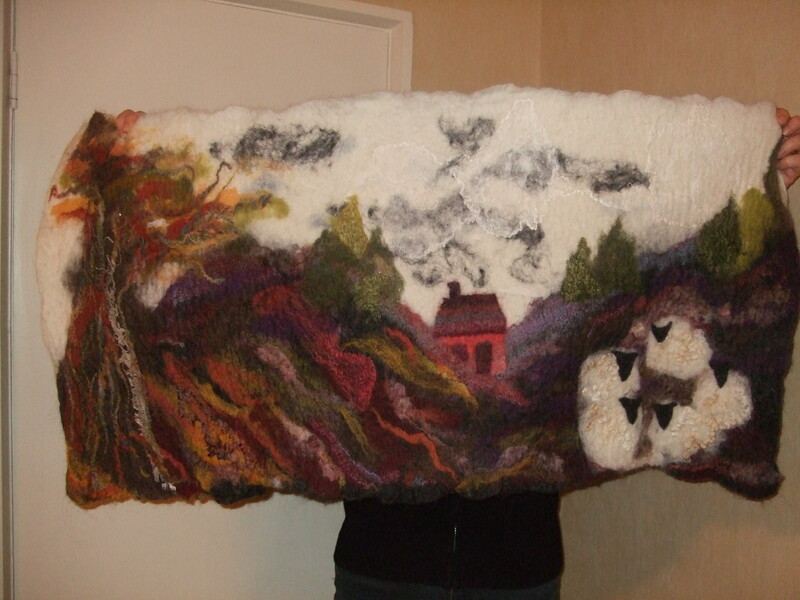 :>( Am going to a felting workshop in San Diego…..3 hour drive from where I live……am looking forward to it this weekend. Wish you were so much closer to me, not 1/2 a world away….. as I would love to take part in your workshops.